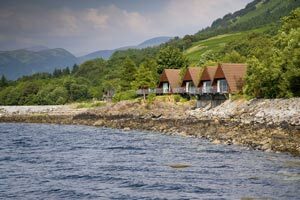 Loch Linnhe Waterfront Lodges are constructed to a very high standard and are built like a proper house which is unlike a lot of other lodges which are prefabricated. Loch Linnhe Lodges are built properly with proper foundations and are all superbly insulated using the latest thermal efficiencies to ensure that they remain warm and cosy even in the colder winter months when hill climbing and skiing are so popular in the area. They are completed with only the best materials and furnishings and are constantly being refurbished and improved. We hope, like us, you will find the breathtaking views across the loch make you want to linger longer, and like many guests before you, you may find yourself returning to this idyllic and unspoilt spot time and time again. "We thoroughly enjoyed our week"